The Red Door Thrift Store in Clare is opening a second store in Sanford on Friday. The grand opening will be at 369 W. Saginaw Road from 10 a.m.-noon. 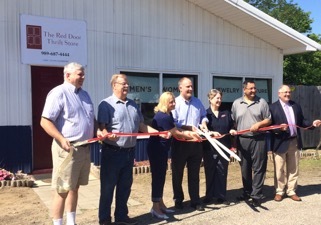 A ribbon cutting ceremony with U.S Congressman John Moolenaar, Sen. Jim Stamas, Rep. Gary Glenn and a representative from Attorney General Bill Schuette’s office will take place at 10:30 a.m. with light refreshments and many in-store sales offered to those in attendance. In Clare, the Red Door will host a Re-Grand Opening at 1006 N. McEwan with an all day sale and special music from 2-4 p.m. featuring Jonathan and Jasmine Harper. To continue the celebration, both stores will be hosting a series of “customer appreciation sales” for shoppers looking for the best deal at the best price. For years, Joshua’s House has worked diligently hosting fundraisers to maintain the operating costs for the maternity home located in Clare. The board, staff and volunteers have been working toward having two stores that would help to support the shelter, as doing many fundraisers has a tendency to wear on those faithful helpers. Eventually, the goal is to operate six maternity home shelters throughout the state of Michigan. Each shelter location would ideally have two thrift stores to assist in supporting that local shelter. “It is an honor for us to serve those that are so desperate for someone to reach out and help them when things are looking so grim. We can make a difference, each one of us can make a difference if we try,” added board member Sherry Combs.